Coleman’s New Echelon™ zoning Communicating Control achieves temperature and humidity setpoints. SA new zoning Echelon™ Communicating Control from the Coleman® brand of Johnson Controls, the global leader in building efficiency, provides up to six zones of temperature and humidity control from a single zone panel. The control offers a choice of three communicating sensors, including a touch screen sensor that controls temperature and humidity levels, a zone display that enables temperature and fan adjustability, and a zone sensor. The color touch screen can be used as both a master and a zoning sensor. Damper flexibility is indicated by power open/power close dampers as well as normally open and closed dampers. A bypass damper is optional. The zoning control enables fan programming by zone. Airflow adjustments can also be made by zone to compensate for ductwork variability. 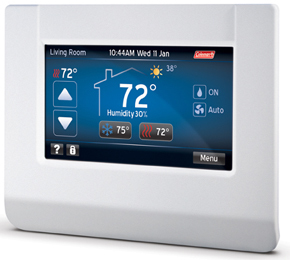 Like the non-zoning product, the zoning Communicating Control communicates with all key components in a home comfort system, providing total system integration that ensures maximum system efficiency and homeowner comfort while equipping contractors with a reliable, distinctive tool to increase profits and build their business. In addition to displaying equipment and accessory status, the control offers a simplified four-wire plug-and-play design that eliminates time-consuming wiring and system checking at installation. An auto-configuration feature automatically recognizes and configures new compatible components. The touch screen display can be configured to give homeowners the level of information they desire, including basic or detailed fault alerts with the contractor’s contact information prominently displayed. The tool also provides maintenance reminders that encourage homeowners to continue working with the contractor to maintain their home comfort system and ensure its efficiency. For more information, visit www.colemanhvacdealer.com.